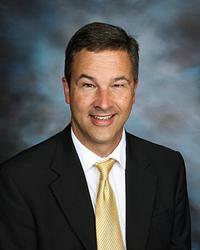 Dan Wolfgram is the Principal of Little Wolf Jr/Sr High School in Manawa. Prior to this he was the Director of Choral Activities at Waupaca High School, Waupaca Wisconsin, where he conducted four of the six choirs offered: Concert Choir, Mixed Chorus, Die Meistersingers, Vocal Jazz Ensembles, and the Director of the Annual Musical. He received his Bachelor of Music Education from the U.W. Eau Claire in 1989 and completed his master’s degree in Educational Administration from Marian College in 2004. Mr. Wolfgram is in his 29th year of education. Previous teaching experience included teaching at Wisconsin Dells High School for two years. In addition to Mr. Wolfgram’s school administrative responsibilities, he is also the Chairman of the Fine Arts Festival of Waupaca, and principal conductor of the Waupaca Community Chorus and Civic Orchestra. Mr. Wolfgram’s singing experience includes the Monteverdi Master Chorale of Stevens Point, the White Heron Chorale of Appleton, and Mastersingers USA. He is an active adjudicator for the Wisconsin School Music Association (WSMA) and is a frequent guest conductor at area camps and festivals. Mr. Wolfgram also served as the Director of the Masonic Show Choir of Wisconsin for two years. He is a recent appointee to serve on the WSMA Board of Directors for District 6. Mr. Wolfgram has been a member of the Waupaca Community Choir for 27 years and has been the principal conductor since 2008. To contact Mr. Wolfgram, please use the Contact Form and select Waupaca Community Choir.